In the year 1978, the first ARM controller was developed by Cambridge University. In the year 1985, Acorn Group of Computers produced the first ARM RISC Processors. 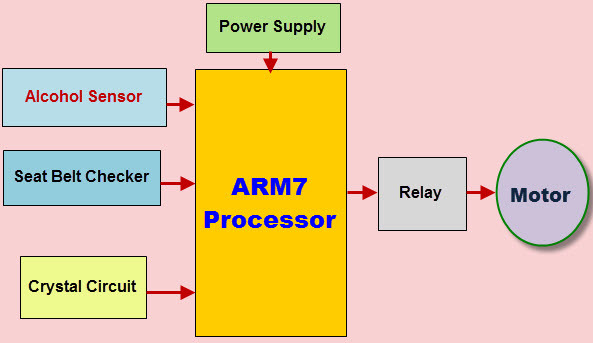 In the year 1990, ARM was founded and become very popular. The ARM stands for Advance Risk Machine,one of the widespread and most licensed processor cores in the world. Thus, ARM controllers are especially used in portable devices such as mobile phones, digital cameras, wireless communication technologies, home networking modules and other ARM based embedded projects due to the advantages like reasonable performance and low power consumption, etc. Nowadays,most of the projects in embedded systems are developed by using ARM microcontroller and processors. A system that has dedicated software which is embedded into hardware utilized for a specific application or product is known as an embedded system. As a platform for a wide range of applications, embedded systems allow to build many electronic and electrical projects. Presently there are many processors and controller families used in embedded systems such as 8051, PIC, AVR, ARM, Motorola and so on. The ARM embedded systems use different versions of ARM processors where each version varies with increasing functionalities. Therefore, this article in intended to give advanced ARM processor projects with a brief explanation. Speed control capability is one of the most important features of the DC motor. The speed of the motor is controlled by varying the voltage applied to it based on the required operation of loads. The speed control mechanism is applied in many real time applications like paper mills, conveyor and elevator control, irrigation systems and other industrial applications. This project provides a way for DC motor speed control system that alters voltages applied to the armature using an ARM processor. In this proposed system a motor-driver IC is used to control the DC motor with the help of ARM-processor. The speed of the DC motor is controlled by a push-button switch which is interfaced to the ARM-processor for giving the percentage of duty cycles. 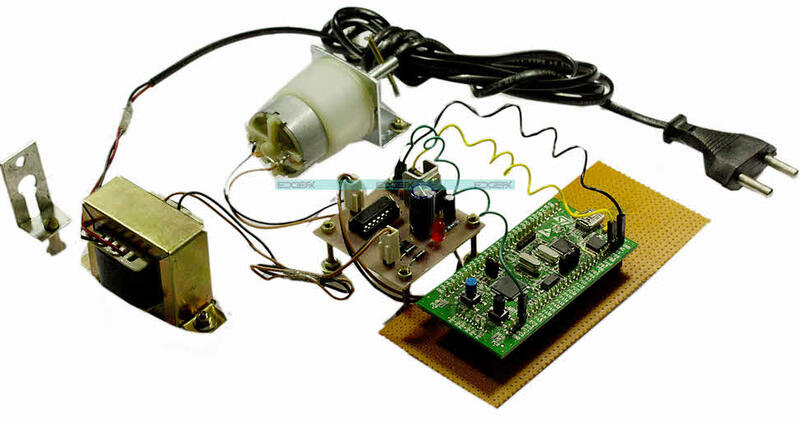 The speed control of the DC motor is achieved by varying the duty cycles (Pulse Width Modulation Pulses) from the ARM series processor as per the program. The ARM series processor receives the percentage of duty cycles from the push button and delivers the desired output to switch the driver IC to control the speed of the DC motor. Nowadays, many accidents are occurring due to the rash driving by drunken people and this eventually may lead to the loss of many lives. The driving of drunken people leads to death and this problem arises due to the improper checking by the police. To overcome this problem the ARM processor project is developed as a solution for the identification of drunken people to avoid accidents. 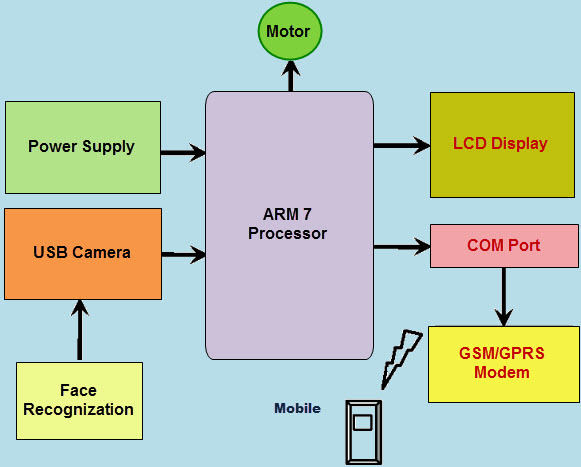 This proposed system uses an ARM7 TDMI advanced version microprocessor which acts as the heart for whole system. It is an effective system that ensures multiple functions in a single car. This system automatically checks the following aspects: whether the person is drunk or not, seat belt insertion, and vehicle driving with the use of sensors. If this prototype detects the drunken people by alcohol sensor or improper seat belt insertion by sensor,then it automatically stops the vehicle with the help of the DC Motor interfaced to the microcontroller by using relays to perform the operation. From the past two decades, vehicle thefts have been increasing rapidly and in the year 2009 United States of America has reported that nearly millions of cars are stolen. There are many technologies implemented to reduce these vehicle thefts. Thus, this project is designed to develop an embedded system, which starts the vehicle by recognizing the face through the camera. This proposed system uses advanced ARM processor to provide the security for smart cars from thefts or robberies. The system works on the principle of component analysis- linear discriminate analysis algorithm which recognizes the face of the driver who starts the car. The ARM processor is programmed in such a way that if the corresponding result is authentic then it generates a signal to run the stepper motor in order to start the car automatically. If the result is not authentic then it produces an interrupt signal to stop the car engine and informs to the car owner that unauthorized access with the help of GSM via SMS. In many rural and urban areas, water scarcity is the major problem and wastage of water during supplying is treated as a major culprit. This project provides a solution to operate water pumps or motors for the required time duration. Many times we forget to turn OFF the water pump or system after the prescribed time, this might be leads to pour out of the water from the tanks. This proposed system uses two power supplies, one is a 3.3 volt power supply for microcontroller and other is regulated power supply of 5 volts for modules. Here four switches are interfaced to the ARM processor for giving input time slots. 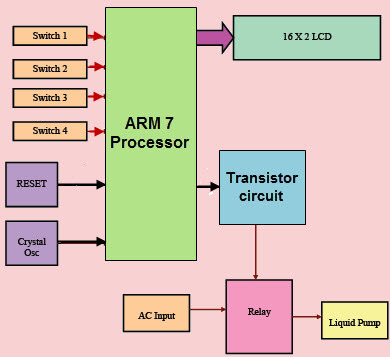 ARM processor is programmed in such that for every switch pressing it enables the output for driving the transistor circuit with certain time period. This transistor circuit further drives the pump through the relay. The 16X2 LCD is interfaced to the processor for displaying the time duration and also to indicate the status of the water pump. Solar street lights were mainly used in remote areas, where electricity supply is not always available. Nowadays solar technology has been progressing in both home and industrial applications. The solar street light system is used to convert the sunlight into electricity by using solar panels in order to power up the street lights. For conserving the electrical power, here an auto-intensity control of LED-based-street light system is implemented that works on solar energy. This proposed system uses an ARM-Cortex processor of the STM32 family and a battery for power supply. 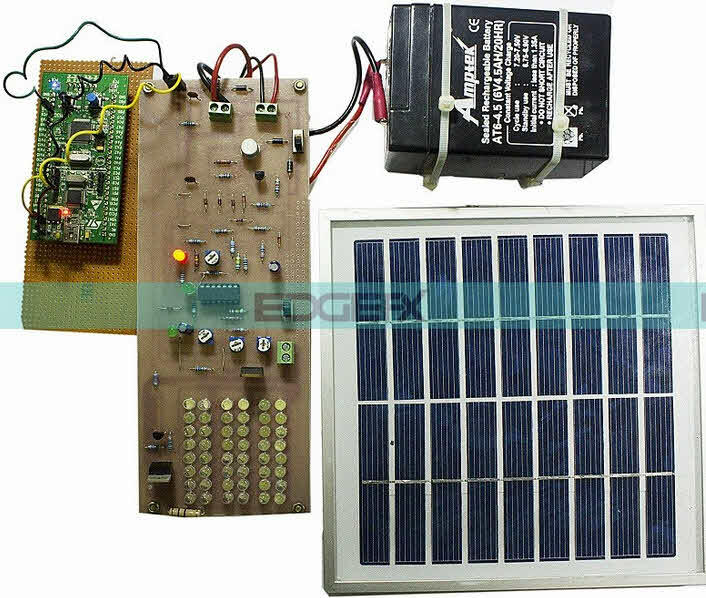 This project uses a solar panel to charge the battery whereas charge controller circuit controls the charging of the battery. ARM-Cortex processor is interfaced to string of LEDs with the help of the MOSFET Switch. The intensity control of the LED lights is possible by varying the duty cycle from a DC source. A programmed ARM-Cortex microcontroller unit is engaged to provide different intensities at different times of night by using the PWM technique. The charge controller circuit is used for protecting the battery from the following conditions: overload and deep-discharge. These are the most popular ARM processor projects implemented in real time applications. We can also develop these arm microcontroller projects using advanced versions of arm embedded systems. You can write to us for developing and programming these projects practically and for some more latest arm processor based projects. Sir this is Bhavya m Final year ECE student I need to know arm controller related best real time projects pls send me the list to bavyamanu@ Gmail.com.